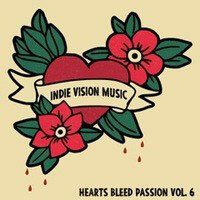 JFH News: Indie Vision Music Releases Free Download of "Hearts Bleed Passion Vol. 6"
On the Heels of the Re-launch of the Indie Vision Music Website, Hearts Bleed Passion Releases Free of Charge, Showcasing 88 Bands From a Variety of Genres. Orange County, CA - Indie Vision Music is proud to release their first independent band compilation since the site went into hibernation over a year ago. With a relaunch on the horizon, the independent Christian music website is celebrating with the release of HEARTS BLEED PASSION Vol. 6, a massive project featuring a vast variety of 88 different artists from around the globe. Indie Vision Music first launched compilation projects in 2004 with the first 3 volumes being printed on CD (now available free of charge in the IVM Bandcamp Music Store). These curated artists all share a personal love and passion for their music, their art, and their craft. This music lives and breathes passion all of which bleeds from the heart of the artist. This free compilation has been split into two parts which are both available in multiple digital formats on the Indie Vision Music bandcamp music page. DENS, The Fast Feeling, Eaves, K. Gautier, House of Heroes, Sow and Tether, An Honest Mistake, Courage Dear Heart, Windowsill Audrey, Some Dark Hollow, Iron Sharpens Iron, One Way Home, Lights Go Down, Hangnail, October Bird of Death, At The Wayside, Midnight Hour, Everything In Slow Motion, Little Hurricane, Orion Walsh, Army of Three, Signum Regis, The Frozen Ocean, Bird Passengers, Sherwood, Steven Combs, Haydon Spenceley, InnerWish, Tyrants, Oceans and Vessels, Metanoia (Chile), Dave Owens, No Lost Cause, Strategic, Peter 118, The Calvinists, The Old-timers, MrENC, Five Iron Frenzy, Vocal Few, American Arson, Comrades, Seeker & Servant, My Epic, Zach Bolen, The Jellyrox, Arms For Elephants, The Hotshot Freight Train, Heart Like War, Mayfly, Nick Powell, Merci, Seth Davey (Ex-Attalus), Hemingway, The Blamed, Grandpa Loves Rhinos, Silent Culture, The B-Listers, Platoon 1107, Fire The Sun, Hailey Wiggins, Harmony, The Altar Billies, Jeffrey Book, Endseeker (US), Bryson Price, Emery, Rideau, To Speak of Wolves, Chris McCall, The Pawnshop Kings, Sef Idle, and more. IndieVisionMusic.com is set to relaunch in mid October, featuring reviews, interviews, music downloads, discussion groups and more. New limited edition Indie Vision Music Merchandise, along with shirts from favorite bands, are already available at https://www.teeblaster.com/store/indie-vision-music. For more info on some of these artists, visit the JFH Artists Database.